We are very happy to share this article as a guide, but please remember that we are not the best DIY travel planners, not experts in budget trips either. Our itinerary had loopholes and we had misadventures. So I would suggest that you take all the tips you can get from here and build an itinerary based on your own interests. Ed and I are big fans of budget airlines. We have survived nine hours without the fancy inflight dining and entertainment during our trip to the Philippines. So we thought, why can't we do the same for our trip to Istanbul which is only less than 5 hours. Currently, there are three budget airlines with direct flights between UAE and Turkey; Fly Dubai, Pegasus and Air Arabia. Two-way ticket prices are almost on the same range (1,000 to 1,500 AED/person). We chose to fly with Air Arabia, although its hub is in Sharjah, as it has the perfect flight schedule for our itinerary. In terms of a place to stay, Turkey has a lot of options for budget-savvy travelers - from a bed in a mixed-dormitory to a private room with an ensuite bathroom in a boutique hotel. We directly booked our stay in Cappadocia and Selcuk in the hotel website. While for Pamukkale and Istanbul, we booked through the ever-trusted Booking.com. A deluxe room in a boutique hotel with breakfast for two people costs 100 - 300 TL/ night. Our daily budget for food was 50 TL/person. That is without breakfast since we're having it in the hotel. There were days when we overspend, but most of the time it was just right. A meal for two in a small restaurant ranges from 20 - 50 TL. How much did I spend in total? Ed and I have a common travel fund, so we usually don't calculate how much each one of us has spent. 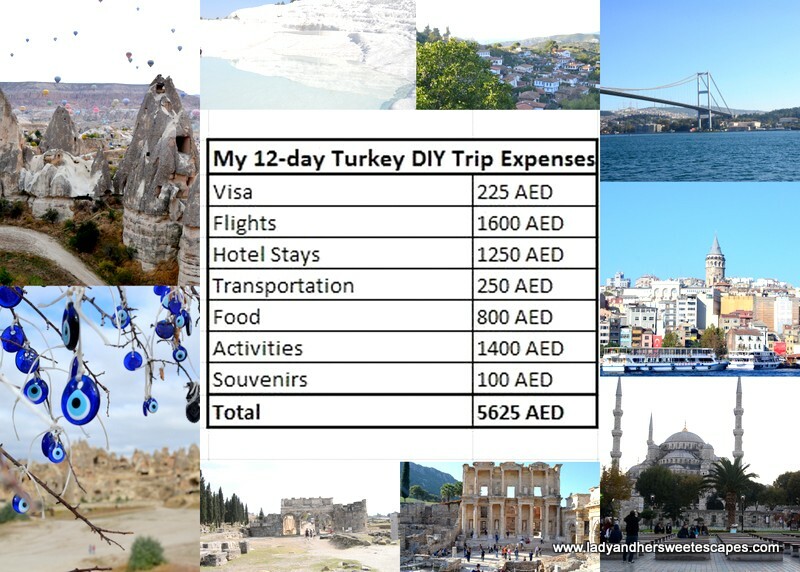 But to give you an overview on the amount you have to prepare if you're traveling alone or with a group, I did a simple math and divided our total expenses into two. Hahah! So, it's 5625 AED or 4300 TL or 1500 USD for one person. All prices stated in this blog post were as of November 2015. 12 days are never enough in Turkey. So for this trip, we focused on the highlights, the major attractions, and the ones in our 20 before 2020 list. Here is our DIY itinerary. For more details, please click on the links (words in pink will lead you my previous posts). * Now, this is the part where we got lost. Bring your map and ask around! Love this? Watch our Travel Videos. Want to go? Read about my Turkish Visa application in the UAE. Looks like a fun husband and wife bonding trip! Indeed it is! Thanks Mav! Thanks for this itinerary :) Used this sa visa application ko and just got approved yesterday, but for 9 days hehe sooo excited! Yay! So happy to hear! Have fun in Turkey!